In2Events have worked with a number of clients at the BETT Education Show and 2018 was no different with no fewer than 5 stands being installed by the team for this years exhibition. The BETT Education Show is a major date in the calendar for many of our clients who use the show as an opportunity to showcase new and existing products and meet with customers and prospective customers alike. The industry show has been running since 1985 and brings together over 800 leading companies and 34,000 attendees every year. Having worked at the show for a number of years we have been privileged to watch our clients stands grow and development year on year and are proud of what we have been able to achieve together. 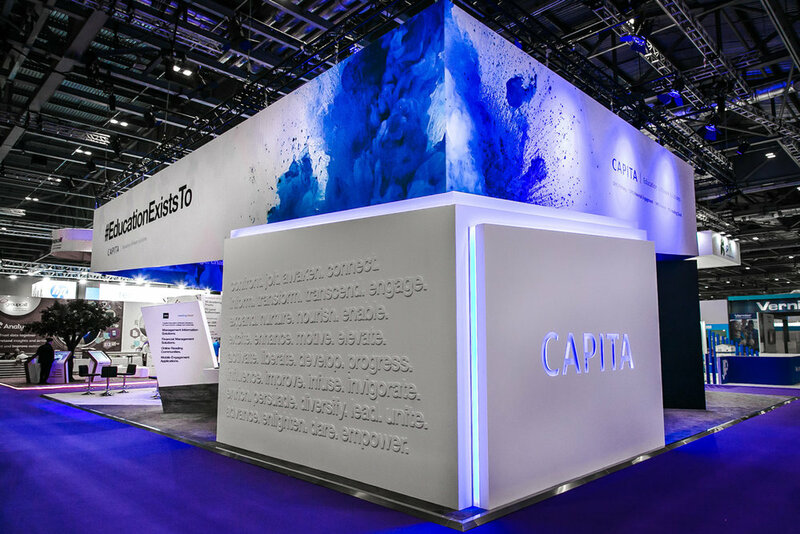 We have worked with Capita for the last 4 consecutive years on their exhibition stand, and this year we had an exciting opportunity to take a fresh and creative approach to their brief inline with the companies overall brand overhaul. 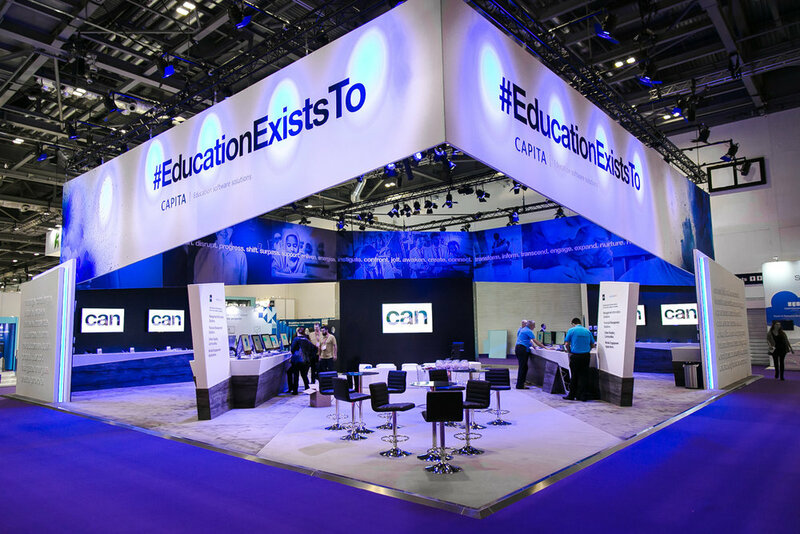 This year Capita was approaching the show around the campaign 'Education exists to...' and we were tasked with developing a tangible, inviting and evocative event space, whilst providing a platform to regenerate Capita's brand image at the show. The result was a show stopper. The feedback from the client, and most importantly, their customers, suggested it has been one of their most successful years yet. Pretty impressive don't you think? Exertis Unlimited is an existing client of ours and following their acquisition of Medium Ltd were given the opportunity to work with one of their vendors, C-Touch. This was our first year working with the brand and it was important for us to understand them quickly and translate that into a workable stand design that met their exact requirements. The stand needed to showcase C-Touch products, covering a range of touch-scales alongside their complimentary & integrator apparatus such as laptops, tablets and VR technology. We kept the design minimal, and created an open and inviting stand with clean sight lines and finishes. We also provided high-level branding through the use of a hot air balloon fixed to the top of the stand. 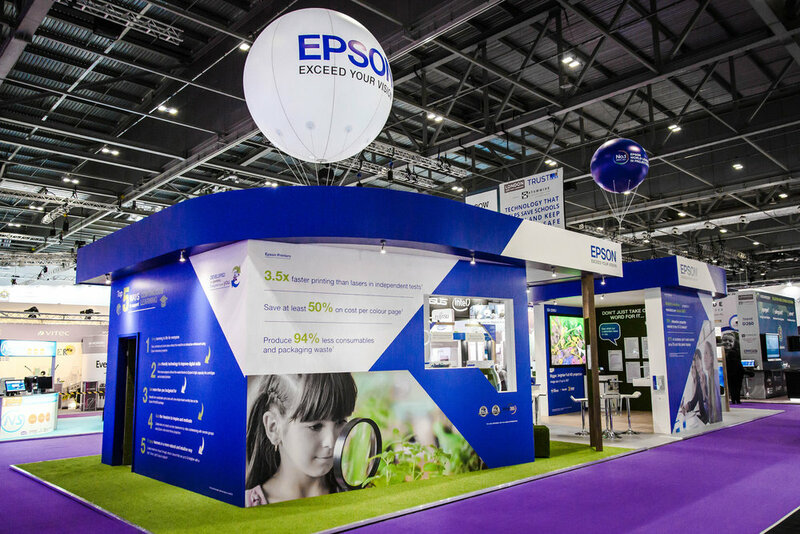 2018 was the 5th consecutive year that In2Events worked with Epson on design & delivery of their stand at the BETT show – Following Epson’s corporate responsibility guidelines, In2Events were asked to re-tender for the opportunity to continue working with Epson on this particular show for 2018 & to ensure we are competitive in the market both in regards to our creative output and stand design & delivery. This year the stand was all about the ecological benefits Epson’s products bring to the Education market through large format print and projection. The stand was designed to subtly reflect this in its design style, with the two main structures reflecting large leaf shapes, alongside curved turf effect walls and wood material finishes. We also continued working with two other clients, Exertis Unlimited and Eventbrite, building their stands for the second year consecutively. The show was a huge success for ourselves and our clients and is great a showcase for some of the fantastic designs the team at In2Events come up for each individual brief. Keep an eye out for our BETT video coming soon for a behind-the-scenes look at the build and meet some of the team involved. If you have a requirement for an exhibition stand please get in touch with the team today.